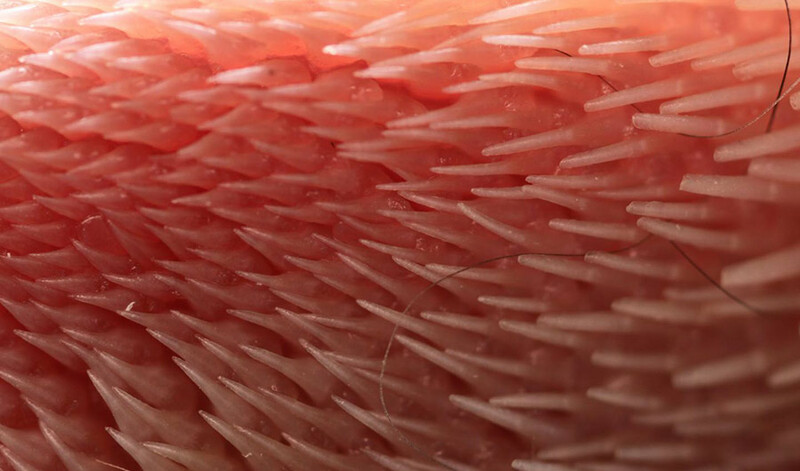 Enlarged view of a cat's tongue. (Inside Science) -- New insights into how cats clean their fur with scores of tiny scoops on their tongues could lead to better hairbrushes for both cats and humans. Domestic cats, which sleep an average of 14 hours each day, spend up to a quarter of what waking time they have grooming their fur. Without grooming, fur can tangle, painfully tugging on a cat's skin and even potentially causing infections. Cats groom their fur with the aid of hundreds of sharp, hollow, backward-facing spines carpeting their tongues called papillae, which consist of keratin, the same substance that hair and claws are made of. To find out what role these spines played, mechanical engineers Alexis Noel and David Hu at the Georgia Institute of Technology in Atlanta performed microscopic computed tomography scans of the tongues of six species of cats -- the domestic cat, bobcat, cougar, snow leopard, tiger and lion. The papillae can reach deep into fur to reach the skin. Since cats cannot cool much through sweating -- they possess sweat glands only on their paws -- the saliva linked with grooming may help deliver nearly a quarter of the cooling effect cats need to keep a stable body temperature, the researchers noted. These findings inspired the scientists to create the tongue-inspired grooming (TIGR) brush -- a 3D-printed silicone rubber mimic of a cat tongue. They found it much easier to clean than a normal hairbrush, research they detailed online Nov. 19 in the journal Proceedings of the National Academy of Sciences. Such brushes could be used for people, or possibly on cats, perhaps to spread cleaning solutions so owners with cat allergies won't suffer the sniffles. Charles Q. Choi is a science reporter who has written for Scientific American, The New York Times, Wired, Science, Nature, and National Geographic News, among others.